With an exciting history and a versatile mix of designs, lucite decor is all the rage! This durable material makes a chic statement, and when the worry is cleaning and maintenance, Lucite pieces make things simple! With a fabulous history that feels like a who’s who of Hollywood glam combined with a list of some of the greatest creative minds of the 20th century, it’s crystal clear why this trend has got me going totally mod! Lucite makes a great addition to any nursery for so many reasons. It’s pretty but super tough (we’re talking about a material that’s used to build submarines! ), so kids can play hard and mommies can rest easy. Lucite is also especially simple to clean—love that! This rocking chair is so perfect for a nursery. I love the sleek style and can see it working with so many different themes and color schemes. It’s neutral enough for a boy or a girl, and when baby is all grown up, this chair would be a flawless addition to a stylish guest room. 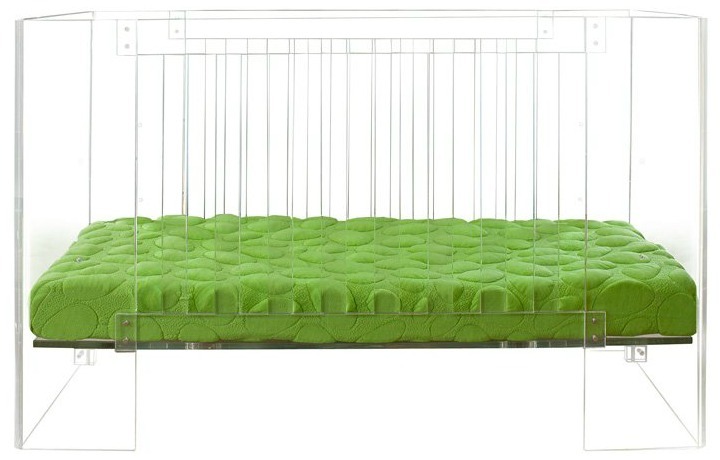 Perhaps the ultimate Lucite statement is this unique acrylic crib—it’s practical and so gorgeous! I’m crazy about the beautiful design and love the added benefit of being able to see everything from all the way across the room. No more peeking in and wondering, “Is she sleeping?” This translucent crib lets you be the ultimate multitasker. Storage can sometimes be an eyesore, but everyone has things they need to organize! This storage trunk is an ultra cool way to store baby’s supplies and never lose track of anything. Find everything you need in a snap, and make it look just a bit more upscale in the process. Store, stack, display and more—you can do almost anything with this acrylic cube. I love the idea of using these cubes to create a DIY shelving cluster or a simple area to exhibit family photos. The shape and clear material put the spotlight on your chosen objects, and they will continue to work as your space evolves. Not to be underestimated, a few cubes and some of your fave flowers or books will definitely make a fun design on a small budget. Lighting is always an easy way to add an updated touch! This lamp is available in perfect colors for any nursery, which makes it a great way to experiment with Lucite. What an exciting take on the traditional shaded lamp! This one is bound to be a conversation starter. Whether you choose to go clearly crazy or add just a touch of Lucite decor, this trend has got serious cred. I’m always excited about pieces that can be a bit retro and totally contemporary at the same time. How would you try out the Lucite trend? I really like the clean, modern look of Lucite furniture, particularly chairs and tables. Fresh idea for nurseries!